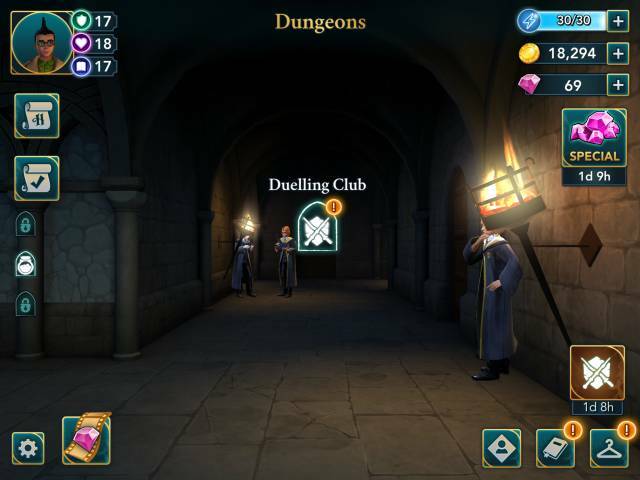 Dueling Club is a regularly held, time-limited, special event in which you can participate to try to gain special rewards, such as Notebooks, to exchange for rare items in them game, such as Pets. You'll find the dueling club in the Dungeons level at the end of the hall. Look for the Dueling Club icon, and just tab it to enter. 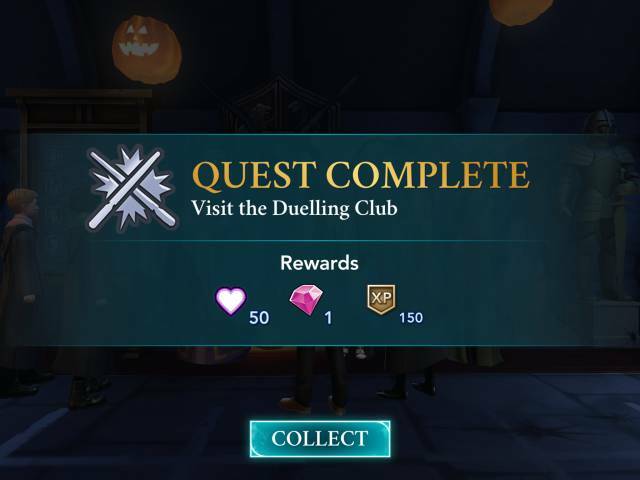 It's worth heading into the event to take a look even if you don't feel you can complete enough duels to win the top prizes and there are some prizes to win along the way, you even get something for just visiting the dueling club! However after the first visit, you may get stuck in actually starting the duel! So... Just leave the room, then enter it again and tap the crossed wands icon above the chalkboard. To play a match you nee tickets, you start off with 3 and use per duel. While the game may give the impression this is a PvP event, it does seems that the actual characters that you face, while being actual wizards of other players are controlled by the game. If you are a higher level thatn your opponent, then it's likely you will know stronger spells and should have a better chance of winning as possibly you will need to make fewer wins in each duel. How to get more dueling tickets? Once you have used all three of your tickets, the game will restore your tickets after 4 hours and you can then duel some more. The countdown only starts when you are out of tickets. 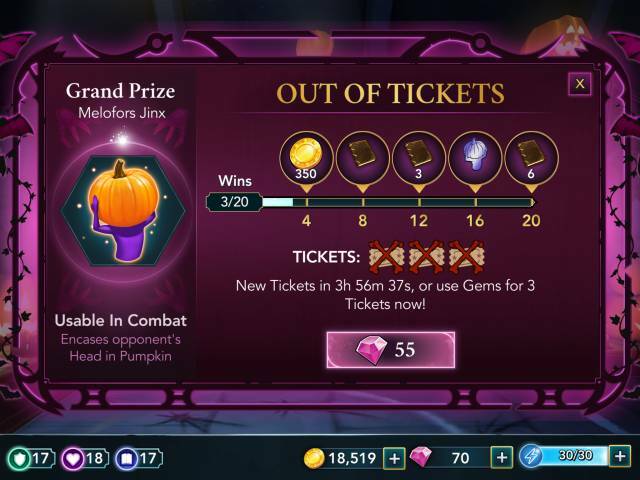 Alternatively you can spend gems to get 4 more tickets. 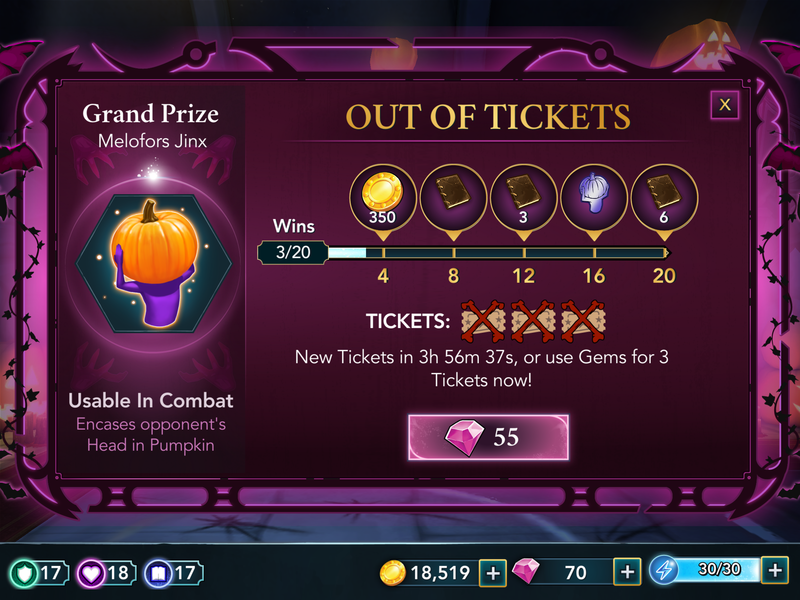 The price may vary, but currently I see it as 55 gems for 3 tickets. It's really down to whether or not you cast the correct class of spell against your opponent. Apart from them if you have more stamina, then you opponent will take longer to kill you. If you have a better selection of spells to use then you also have a better chance of winning. For example, some of the spells you learn are really strong, such as Depulso and will take a huge chunk of your opponent's energy. So, head over to Charm School to take some more classes if you don't have strong enough spells. What can I win in Dueling Club? This will change each time the event is held, as I am sure will the amount of gems needed to restore tickets and other factors in this event. You can expect to win special prizes such as Notebooks that could be put towards the purchase of special items in the game, such as Pets. you may also win attribute points and coins. But you would really have to check with the game exactly what you win each time the event is run, as quite possibly it will change each time. Good luck with your Dueling! There is no real tips that we can offer with respect to what type of spell you can throw, it's a bit like Rock, Paper Scissors! But sometimes you will see a pattern or have a feeling of what you need to throw - Go with that - And good luck! Feel free to drop us a comment or a question, if you need further help with anything in Harry Potter: Hogwarts Mystery.